Starting under the skin of this elegant and minimalistic design, we find electronic air suspension which controlled the spring rates, ride height and attitude. The damping could be altered as well making this a car which had the potential to fill a brief written by Citroen. Going further than Citroen did with their 1988 XM, the Cue-X also boasted four-wheel steering* The description of how it works is very similar to that of the XM: sensors sent signals to the vehicle’s central processor. The data described vehicle height, road speed, steering input, braking forces, throttle position and gear position. Algorithms converted this information to outputs that managed the air springs to offer the best combination of firmness for the conditions. The possible suspension modes combined two spring rates and three discrete damping settings. Citroen scored here with having continuously variable damping and was evens in having two spring rates (comfortable and knobbly). Moving out from inside the car, there is perhaps one of the most striking examples of Japanese automotive design of the period; it’s forceful yet credible. The car evokes that character often described as billet-solid. It looks as if it has been carved from one block of alloy. There is a very satisfying straight-through line from the headlamps to the tail and a glasshouse perched atop a body with a distinct shoulder line. This can be read as very much the ultimate expression of the three box form before rake angles of the glasshouse and body began to merge, creating the amorphous silhouettes of the early 90s. The work here is in the radii blending between what are still relatively straight lines. For anyone of a certain age this is the high-point of car design: the refinement of the three-box form that still left the three boxes as distinct units. Despite the CUE-X having what we would call today an angular profile, the car’s cD only nudged 0.24. The flush glass is as fine as you’ll find on Audis of the same period. Notice the asymmetry of the front graphics. The small black oblong is a rain-sensor. The rationality of the headlamps perhaps inspire VW’s much less refined though equally technicalesque B3 Passat of 1998. And the timing is exactly right – three years from the appearance of the Nissan to the appearance of the Passat. Wolfsburg’s design team had more than enough time to perform their nod to Nissan. So, how does the Nissan Cue-X rate against the well-known characteristics of Japanese aesthetics? We have fukinsei in the assymetric front end. Kanso is captured in the simplicity of the forms. Shizen makes itself felt in the lack of ornamentation. This car is not pretending to be somethings else. The car is not obvious in that it is not flashy. It takes some time to appreciate the level of refinement in the car’s details. That’s yugen accounted for. And finally, the car is calm even while the positioning of the glass house suggests performance. So we have datsuzoku and seijaku in there as well. This car is as Japanese as a Corolla crammed full of manga comics with the sounds of Pizzicato Five booming from the stereo. [Image source for 1989 Infiniti Q45:here. Very nice article about a great concept car. I agree that the CUE-X would have influenced the Infiniti Q45. 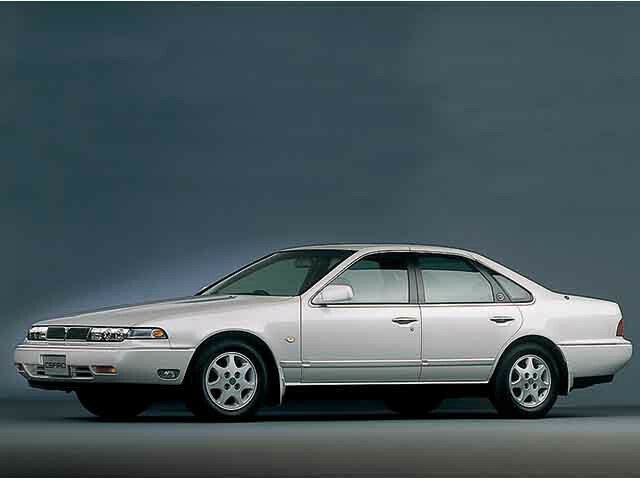 I also think that the 1988 A31 Cefiro can trace its inspiration back to CUE-X. Seeing this, it becomes clear what a good job Roy Axe’s team did with the Rover 800. … the dash is rather Alfa 164-a-like. The 1980s were a golden age for rationalism in industrial design. Yes – this might be a Japanese equivalent to the Ulm school of design that the 1991 S-class epitomised. There are no tricks on this design. I really, really admire this. It’s a very believable design and would turn heads today. Mark: I can see the proportions of the CUE-X in the Cefira, but the rest is quite different. And I can see the detailing of the CUE-X in the Q45 but that car is FWD and the proportions are all wrong. About the Rover 800: I can´t see how the CUE-X informs that at all. The second concept for the Rover 800 is Citroenesque. All that was retained that I can see is the cantilvered-effect glass house. The final car has very little to do with the early work. Or were you thinking of the J30 Maxima from the same era? Richard: I can see a great deal of the Rover 800 in it, which is not to say that one influenced the other, but that both were the fruit of a similar brief. Both offer rectilinear shapes and aero-smooth glasshouses. Both have a pronounced bumper height colour contrasting character line. And the interiors (to my eyes at least) are clearly from a similar school of user-led industrial design. Mark: I was wrong – clearly I had the other car in mind. The Q45 looks FWD though, doesn’t it? I must say I like these big Japanese vehicles. It would be more interesting if they had not gone extinct in Europe. Never saw this car before but I love it. 3 box saloon perfectly proportioned. I see what you mean about the headlamps looking a little like the late 90’s Passat. Am I dreaming or is there a hint of testarossa from the rear? There is, yes, in those technicalesque slats. Nissan influencing VAG? How about the 1987 BE-1? It’s the Lupo / Arosa ten years ahead of its time. Someone should email that amazingly proportioned side profile of that car to the hapless folk at Lincoln. The Infiniti suffered the exact same problem as the new Lincoln Continental: it looks FWD which sadly the Lincoln is though the Infiniti wasn’t. Baffling. That’s quite true. I thought the Infiniti was FWD. And this was done 10 years before crash protection required such forms. This is the Lincoln Effect: great idea! Let’s lose it in translation. The Lincoln Continental is even worse though. Next Next post: How Objective Is Top Gear’s Rating System?